Another hectic week has just passed, culminating in the carpeting of the two front rooms, the release of a couple of hundred books to their new shelves, and the establishment of my office. This picture on the left, taken from the room to be my office, reminds me of something our wonderful Australian author, Drusilla Modjeska, has said about the artists, Stella Bowen and Grace Cossington-Smith, in her books Orchard and Stravinsky’s Lunch. 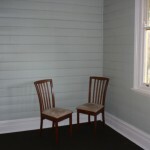 Both these Australian artists produced domestic interiors without people in them. She said the open doors of these studies which always lead into other spaces, reveal infinite possibilities. The picture on the right gives you some idea of the colour of the carpet. It is a dark brown, called “chocolate sisal,” and it is perfect, I think, with the green walls and white ceiling and trim. This part of the much bigger room is the far end from the bookshelves featured in last week’s blog, giving you some idea of how the space has been arranged so far. 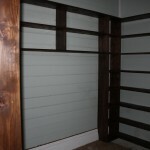 Where do you put several thousand books? I mentioned that the larger room in the front of the house—one of the original rooms—was very large. Probably too big for a bedroom. Yet I wanted a guest bedroom. The other problem that needed solving was what to do with the thousands of books I’d brought from Brisbane, books that have been collected over a lifetime. Though it’s not fashionable these days to collect books, there are enough bibliophiles left in the world who still love them, to feel vindicated by what I wanted to do. People who love the smell and feel of books, who write marginalia in them, or who merely read the thoughts of others before them that are left in the margins. Before I’d arrived in Victoria I had parted company with many more books than I’d brought with me, so there’d been a cull. The few thousand I’d bought were therefore definitely my favourite books (give or take one or two that may have sneaked in somehow as a result of moving-fatigue). Anyway these books have languished in boxes for months with my increasing feeling of frustration for not being able to access them at times when they were needed. For instance, without my bird books I haven’t been able yet to properly identify the glorious little creatures that chirp and flit around in my garden. But this dilemma is about to end. My elder daughter is a fellow bibliophile who has an excellent collection of her own books. She is also a writer and an artist. Utilising this last talent, she drew a picture of the big front room with bookshelves arranged around a bed. Now I’ve quibbled about pictures always being worth a thousand words, and here is a classic example. These pictures simply do not do justice to the reality. But here they are anyway. For your delectation. It’s true I still haven’t decided on a bed to go in that big space under the middle row of shelves, or organised the lighting, but these decisions will be made as things are starting to fall naturally into place. 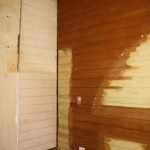 Remember, this all happened in a single working week, with repairs to walls, floor, skirting boards and cornices. 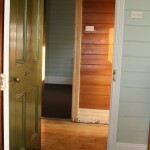 Even the enormous, old-fashioned sash windows which had previously been painted shut, may now be opened. 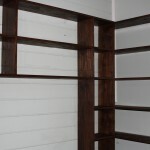 Strangely, for this wasn’t the original intention, the shelving against the original tongue-in-groove walls gives the room a Japanese look. Another room—or large hallway —in the house has a similar Japanese feel about its design. 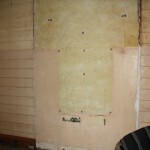 This is where the last owner had mounted flattened T-chests on one of the walls. It sounds bizarre, doesn’t it? However I will photograph it and you can see for yourself. The best of Japanese art and design tends to be understated and elegant. I love this wall and have left it pretty much as it was when I found it, apart from painting around the edges, the ceiling, skirting boards, etc. Possibly because I am a writer, I am loath to admit that a picture is worth a thousand words. 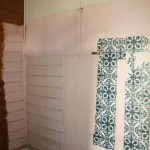 But here are a few photographs of the next part of the house that needs renovating. These are two front rooms that were bedrooms. The larger I am hoping to make into a very comfortable guest room. The smaller I would like to use as my office. 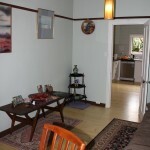 Both rooms required the removal of some cupboards and the larger also contained a set of drawers. When I removed these items I was dismayed to discover that a lot of extra work was required on the walls. In the larger room I could actually see through into the kitchen. The leeks were amazing! Not just the largest I have ever seen, but succulent, sweet and the perfect foil to roast pork. Combined with the potatoes, also purchased from the Castlemaine Farmers’ Market last Sunday, which had a dense rather than floury texture, they made the perfect Leek and Potato Soup which is a staple in this household whenever good leeks may be had. I gave one of the 3 leeks I purchased for a mere $5.00, to a loved one who walked around the market with it lying in the crook of her arm as if she were carrying a baby. (This is where the image came to me of the leek being the size of a small person). Furthermore, I still have enough left over for another ambrosial soup. Which is very easy to make. Sometimes the best things are the simplest. If you would like a recipe for this dish, let me know by clicking on the red comments line at the top of the blog with your request and I would be happy to oblige you. With all the rain we’ve been having, the garden has become wildly overgrown and full of weeds. I spent several sunny afternoons this week pulling out weeds and pruning bushes that have grown over the pathways through it. There was some linoleum that I didn’t throw away that has become a weed discourager. It was probably an idea that Bill Mollison, who died this week, had. One of his many brilliant ideas. Vale Bill. We renovators will miss you. I have a few rooms in the house that still have their old carpet because they haven’t yet been repainted. Instead of worrying about taking this to the local tip, I will be cutting it up and putting it into my garden. Now, because a picture is worth a thousand words—or so they say—I will show you another room that is nearing completion. This was one seen in an earlier “On the Reno” with its floor missing and one of its walls all but destroyed during the re-stumping process. It is the one with the wallpaper on it. 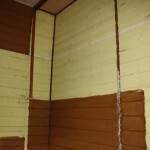 The picture on the left is what this room looked like after the re-stumpers had gone. The one on the left is what it looks like now, though it is a work in progress, still. Before the rain started again, today was a delightfully sunny Spring day for all to enjoy the Farmers’ and Artists’ Market in Castlemaine. This occurs on the first Sunday of each month. It is a place you can buy local, organic food and original artworks, and all at very reasonable prices. 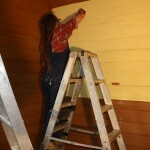 Now you may be asking yourself why I am wandering off the subject of renovating. It is simple, really. When you are working hard on your dream home, you need sustenance. And at places like local markets, you can often pick up something quite wonderful in the furniture line that perfectly fits the style of the house you are re-making, as I did today. I also picked up some delicious-looking potatoes and some amazing leeks, which, it is no exaggeration, were the size of small people! Yesterday I pulled up the linoleum that had been under carpet I had also removed—but some time ago—from the largest room in the house, plus all the old newspapers which were underneath, dated 1947, which is before I was born. Now, after I had read those items of the news that I simply couldn’t ignore, I broke the rather brittle lino into fairly small pieces so that I could dispose of them thoughtfully. 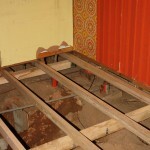 I was wearing a dust mask at the time, something you might consider using yourself when working on a very old house. This big room presents a little problem because it is so large, but I will tell you more about that later. Today was a holiday for me after all the hard yakka, and so off to the markets I did go. The picture at the top of the page is of one of the two items I purchased from a clever man called Robert, who fashioned it. How could I resist a traditional meat-keeper that would fit perfectly into a house that was built on the Victorian goldfields? Well, I couldn’t. 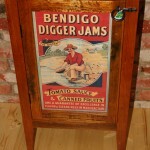 Especially with that delightful poster advertising Bendigo Digger Jams. It seemed to be made for my house. Serendipity, my father would have said, though I believe I was just at the right place at the right time.